THE CHALLENGE: Find four books with covers almost completely in that color/those colors. 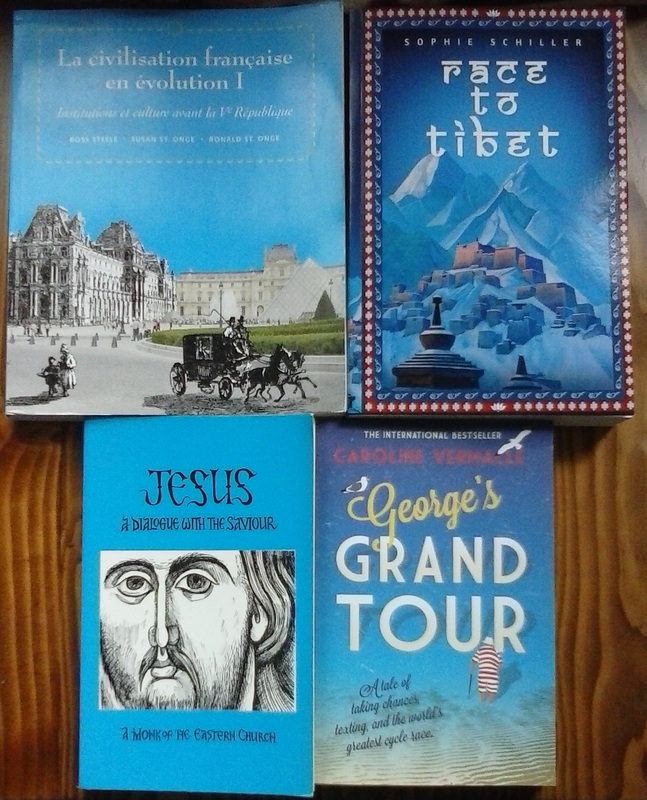 This entry was posted in Art, Bout of Books, Fiction, foreign, Monastic Spirituality, Non-Fiction, Photos, Read-a-thon, Religion and tagged Bout of Books, Caroline Vermalle, Lev Gillet, Sophie Schiller by WordsAndPeace. Bookmark the permalink. Your choices are lovely and inspired, representing several sides of your reading, working, praying, and teaching life! And they’re all blue! Seeing the Lev Gillet book gave me a little push to pick up copies of a few more of his books (The Burning Bush, for one). I may get a copy of the “Dialogue” later too. I’ve finally printed out the Elisabeth Behr-Sigel biography, since I found I wasn’t reading it well on the screen, too much scrolling. funny, I had not noticed, I basically picked them at random, but you are right, I guess it’s a good sample of my shelves and interests! This Lev was probably one of the first ones I read. Perfect for a retreat.